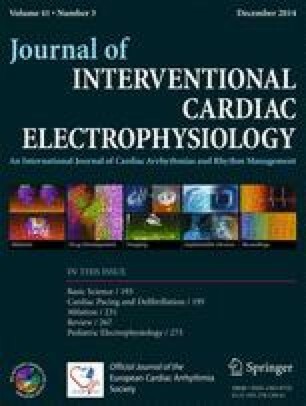 We sought to investigate the use of tissue contact monitoring by means of the electrical coupling index (ECI) in a prospective randomised control trial of patients undergoing cavotricuspid isthmus (CTI) ablation for atrial flutter. Patients with ECG-documented typical flutter undergoing their first CTI ablation were randomised to ECI™-guided or non-ECI™-guided ablation. An irrigated-tip ablation catheter was used in all cases. Consecutive 50-W, 60-s radiofrequency lesions were applied to the CTI, from the tricuspid valve to inferior vena cava, with no catheter movement permitted during radiofrequency (RF) delivery. The ablation endpoint was durable CTI block at 20 min post-ablation. Patients underwent routine clinic follow-up post-operatively. A total of 101 patients (79 male), mean age 66 (+/−11), 50 ECI-guided and 51 control cases were enrolled in the study. CTI block was achieved in all. There were no acute complications. All patients were alive at follow-up. CTI block was achieved in a single pass in 36 ECI-guided and 30 control cases (p = 0.16), and at 20 min post-ablation, re-conduction was seen in 5 and 12 cases, respectively (p = 0.07). There was no significant difference in total procedure time (62.7 ± 33 vs. 62.3 ± 33 min, p = 0.92), RF requirement (580 ± 312 vs. 574 ± 287 s, p = 0.11) or fluoroscopy time (718 ± 577 vs. 721 ± 583 s, p = 0.78). After 6 ± 4 months, recurrence of flutter had occurred in 1 (2 %) ECI vs. 8 (16 %) control cases (OR 0.13, 95 % CI 0.01–1.08, p = 0.06). ECI-guided CTI ablation demonstrated a non-statistically significant reduction in late recurrence of atrial flutter, at no cost to procedural time, radiation exposure or RF requirement. Dr. Jones’s salary is supported by a grant from the Oxford Biomedical Research Centre. All of the above-listed authors contributed substantially to the design and execution of this study; Dr. Michael Jones designed the trial methodology, collated the data and drafted the paper submitted for publication; Mr. David Webster approached the participants, made enrolments and randomisation assignment, collated the data and populated the database; Dr. Kelvin Wong critically appraised the protocol, assisted with the conception of the study design and statistics and reviewed the paper for publication; Drs. Hayes and Qureshi assisted in study design conception and data collation and critically appraised the paper for publication; Drs. Rajappan and Bashir contributed to the design of the protocol, the statistical analysis and the analysis of the data and Dr Betts contributed to the formulation of the concept, the creation of the research protocol, the statistical methods and sample size estimate, the interpretation of the data and the critical appraisal of the paper submitted for publication. Dr. Jones received funding from St Jude Medical to support his salary. Dr. Betts has received speaker fees and research grants from St Jude Medical. Dr. Rajappan has received speaker fees from St Jude Medical.